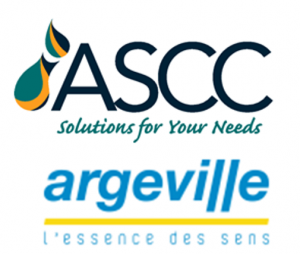 It is with great pleasure that we announce ASCC have been awarded the Argeville distributorship for Australia and New Zealand. Argeville is located in the South of France and is regarded as a sophisticated and superior producer of Fragrance, Flavours and Natural Raw material. Their reputation is founded on their expertise. Argeville’s range of fragrance creations, raw materials and food flavours offer perfumers and the food processing industries the benefit of decades of experience since 1921. The appointment of ASCC as Argeville’s distributor in Australia and New Zealand will broaden the current portfolio offered to our customers. Argeville’s reputation is founded on their expertise in the production, selection and processing of traditional natural raw materials. The synergy and alignment that ASCC can offer Trans-Tasman customers, along with ASCC’s Australian market coverage, excellence in customer service, strong technical acumen and ease to deal with, made this a logical decision. ASCC has a long and successful track record of supplying Personal Care and Healthcare industries with highly specialised products and raw materials across a wide variety of industry sectors throughout Australia and New Zealand. And the addition of various ranges of fragrances, flavours and natural raw materials to our product portfolio has been a proud moment in the continued expansion and growth of our business. With a broad range of industry experts and the back-up of the experts in the production, selection and processing of traditional natural raw materials behind us, ASCC is delighted to continue providing “solutions for your needs”. Argeville is a renowned specialist in oriental, floral, spicy and green notes such as: Tuberose, Lotus, Champaca, Samvac Jasmin, Galbanum, Osmanthus, Saffron, Fenugrec, Violet and Mango Leaf. Argeville has Expertise in the production of Fragrances, Flavours and Ingredients.